Deal Alert! Deal Alert! Deal Alert! Today August 25 until 7pm Enjoy a short stack of pancakes from IHOP for only $1. 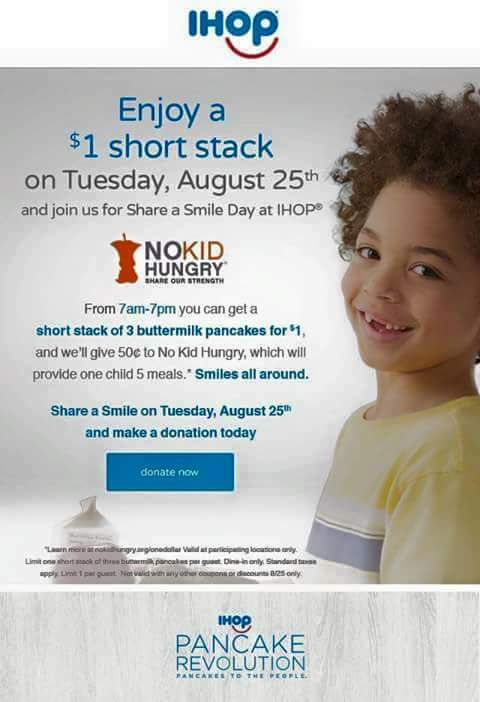 For every short stack that is brought IHOP will donate .50 cent to no kid hungry which gives meals to kids. So save money and give to a good cause at the same time. your helpful info. Thanks for your post. I’ll definitely return. Thank you for finally talking about >$1 pancakes from IHOP | Live Life Half Price <Liked it!